Many years ago I was a pastry chef in an European-style bakery in Palo Alto, California. We made beautiful cakes, pastries, cookies, and breads, but we didn't make pies or tarts. Over the years I have made countless on my own, but I have to admit I have always been a little afraid of the crusts. 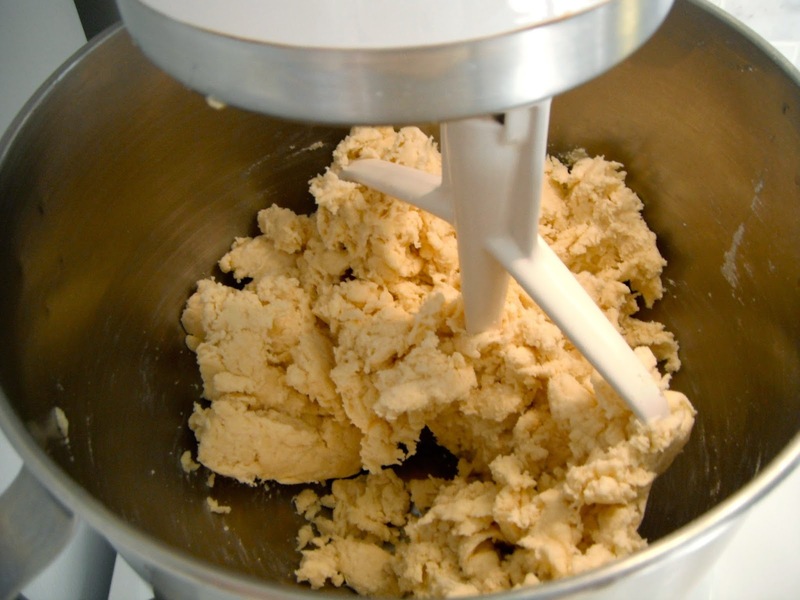 It can be intimidating to find the right balance of mixing just enough to keep the dough flaky and rolling it out at the correct temperature so as not to fight with the dough. This Thanksgiving everything seemed to be in perfect alignment and I felt after many years of practice it all came together correctly. 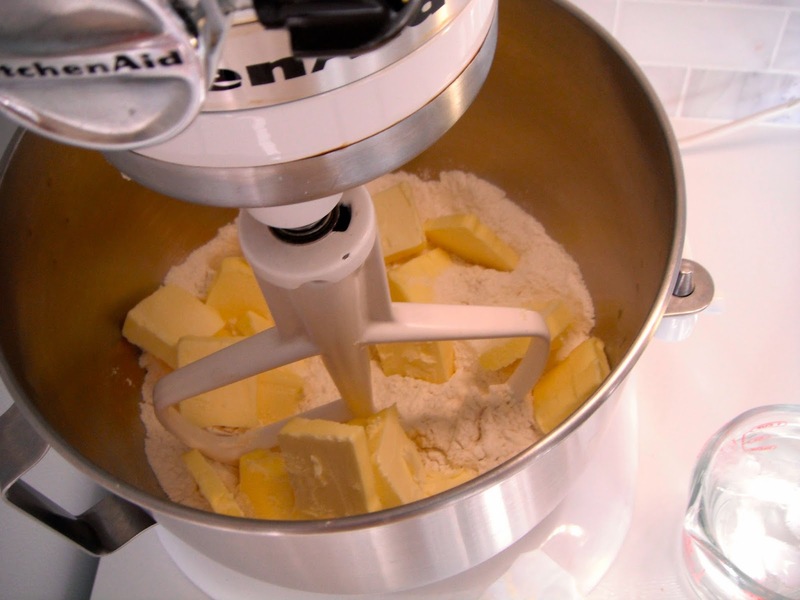 While you can make pie crust by hand, in a food processor, or in a standing mixer, I achieve the best results with my standing mixer - at least in the shortest amount of time. Making pie crust by hand does make a very tender crust and is therapeutic when you need a tactile experience, but when speed is important choose the mixer. Chilling the dough for an hour is the perfect amount of time for it to rest and still be pliable enough to roll out without a battle. I roll the dough between parchment sheets. It allows me to manipulate the dough easily. Parchment sheets are available from a number of online retailers. If you do a lot of baking you might consider purchasing a pack. I use them to line pans, sift ingredients on and roll out doughs. Mine are full sheets, but they come in half-sheets, as well. I think they work better than parchment on a roll because they are wider and don't curl. 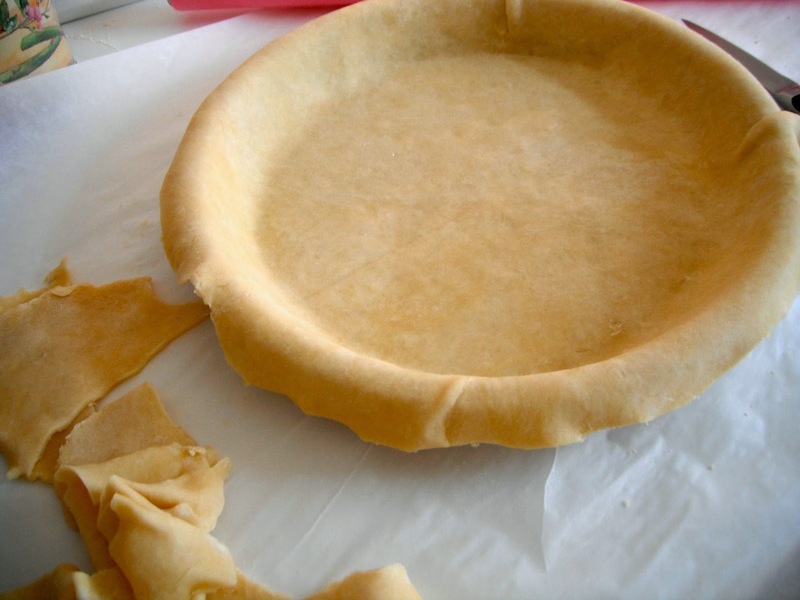 The pie crust is a recipe adapted from Ready For Dessert by David Lebovitz. If you aren't familiar with David Lebovitz, he was a pastry chef for many years at the famed Chez Panisse restaurant. He has written several cookbooks and writes a fabulous blog about his life in Paris. David's cookbooks are so thoughtfully written. Not all chefs, pastry or otherwise, readily share their culinary secrets, but David is so generous with his knowledge and conveys it to his readers with an entertaining and clever writing style. I have made several recipes from his cookbooks always will spectacular results. This is a great basic pie crust recipe. It makes one, double-crust 9-inch (23 cm) or 10-inch (25 cm) pie or two, single-crust 9-inch (23 cm) or 10-inch (25 cm) pies. I agree totally with David on using only butter in the crust. After all, butter is king in the pastry world, it can't be beat for its flavor. 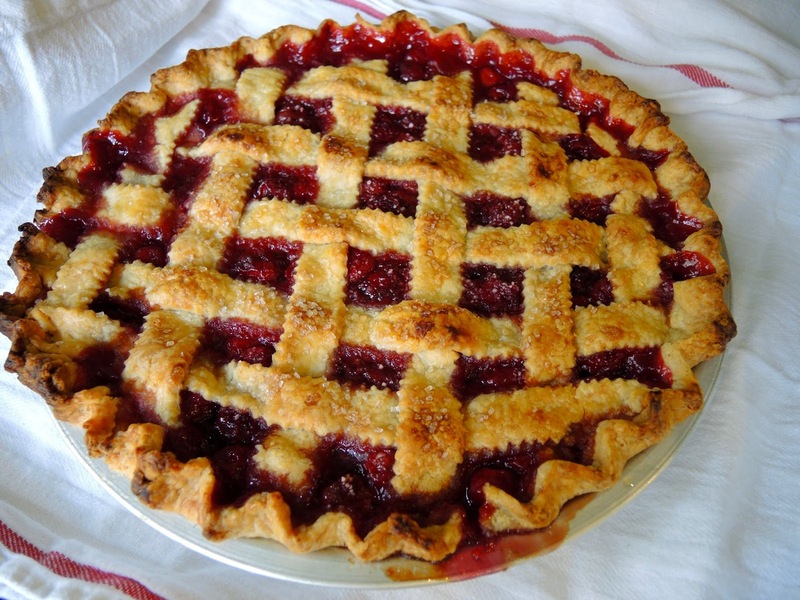 The cherry pie recipe is adapted from my mother's recipe file. 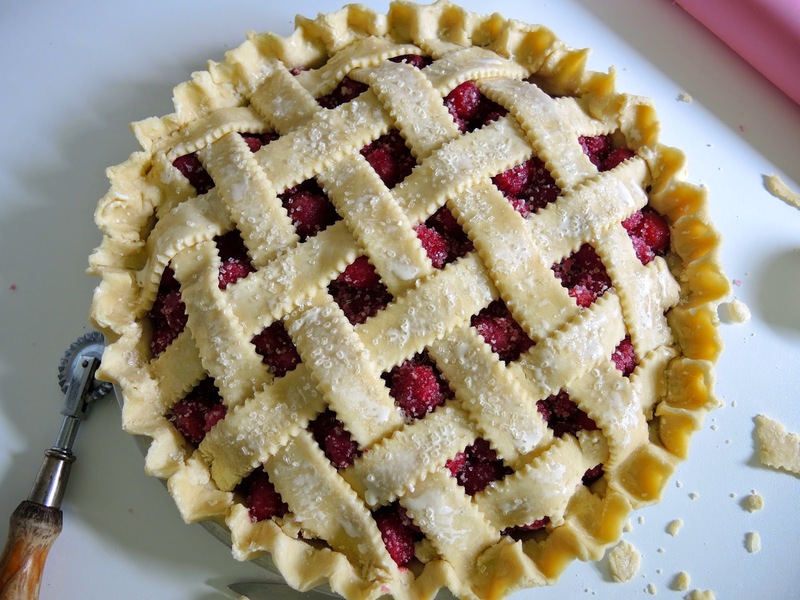 Often fruit pies use flour as a thickening agent. I learned from Jim Dodge, the pastry chef of San Francisco's Stanford Court Hotel to use tapioca instead. It allows the juices to thicken, but remain clear and produce the purist taste without any hint of flour. Use minute tapioca, which is pulverized, or grind regular tapioca in a food processor. In a standing mixer with a paddle attachment mix flour, sugar, and salt. Cut butter into 1/2 pieces and add. 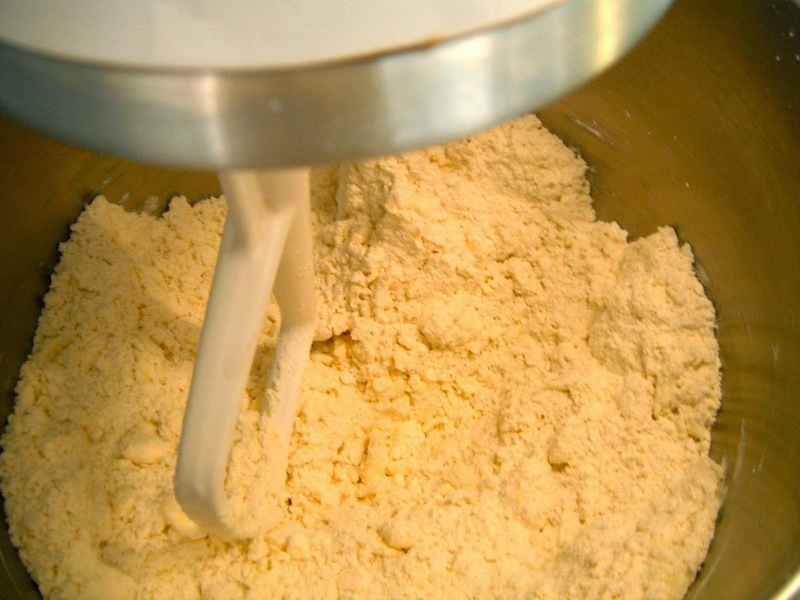 Mix until butter and flour look like coarse meal. With the mixer slowly running add 6 tablespoons of water just until the dough comes together. If it looks dry add another tablespoon or two. Work the dough into two disks, wrap in plastic, and refrigerate for an hour. Preheat oven to 400℉ (200℃). Roll out the pie dough on a floured surface or between lightly floured parchment paper or waxed paper making two disks. Lightly spray the pie pan with non-stick cooking spray. Fit one disk into a 9-inch (23 cm) or 10-inch (25 cm) pie pan. In a large bowl mix cherries, sugar, tapioca, and almond extract together. If using frozen cherries they can be frozen or thawed. Put in crust and dot with butter. 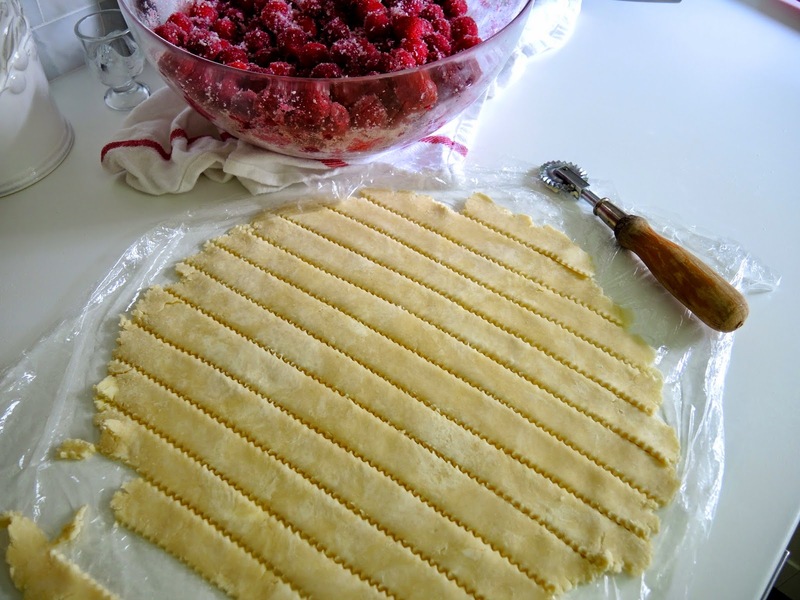 Cut the second crust into strips with a crimping wheel or knife. Weave the strips to make a lattice top on the pie. Crimp the edges to seal. 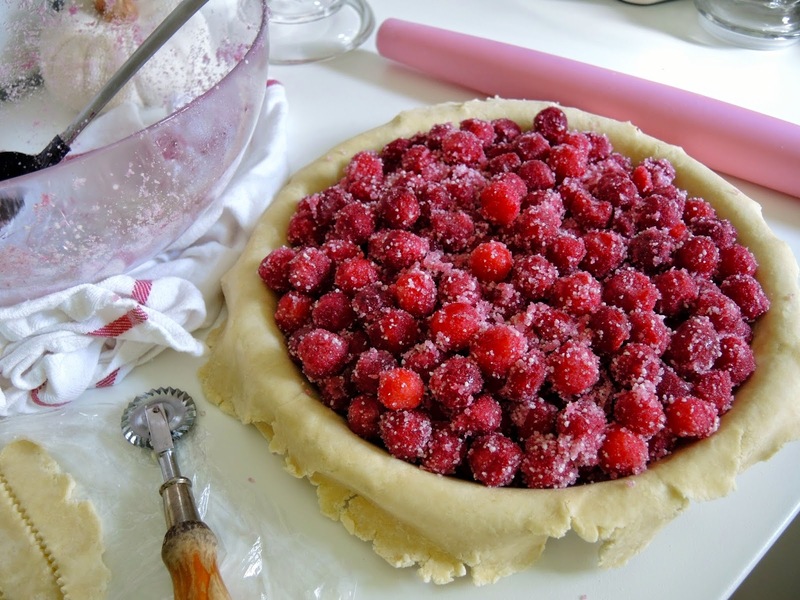 (Alternately, place the second crust whole and uncut over the top and crimp edges to seal.) Brush the lattice top or the whole top depending upon which you use with a little cream and sprinkle with coarse sugar, if desired. If using a single crust make two vents in the top crust with a sharp knife. Bake in the center of the oven until the juices are thick and bubbling. If using fresh cherries bake for 40-50 minutes. If using frozen cherries bake for 50-70 minutes. If the crust gets dark too quickly cover loosely with aluminum foil. It is a good idea to bake on a pie ring or put a pan on the lower shelf of the oven to catch any run-away juices.